The Forum is a beautiful venue. Built in the 1930s as a cinema, it has exquisite art deco style and all the grandeur of a theatre. Its only downside is that it’s a bit of a nightmare to get to, particularly if you’re driving and definitely if you’re driving during a busy Christmas shopping day. We manage to get so delayed that we miss the VIP – and although we’re disappointed, we’re at least there in plenty of time to see the beginning of the concert. Dragonforce are co-headliners for the night and it’s clear that many fans have turned up for them. As singer Marc Hudson points out, they’re also local to London. They play a mixture of songs from the latest two albums with Marc (Maximum Overload and The Power Within) as well as classics from their earlier albums. “I don’t think we could get away with not playing this one,” he says at one point, as they launch into Through The Fire And The Flames – the band’s mega hit well-known for being the final song in Guitar Hero 3. The crowd sing along so loudly that you can even hear them over the band. 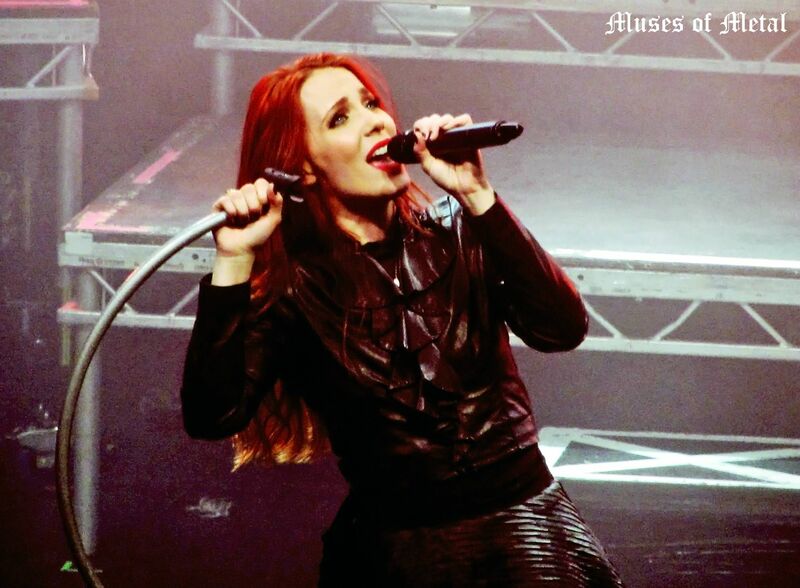 Second Stone and The Essence of Silence – from the start it’s clear that Simone Simons’ live voice has improved since taking singing lessons for the Retrospect concert. Mark Jansen brings the harsh vocals, but they’re a little hit and miss, especially the higher register. Popular singles Unleashed and Storm the Sorrow come next, accompanied by a fantastic light show (someone buy the lighting designer a beer – it’s the best show lighting I’ve seen). We also get the hugely crowd-pleasing Fools of Damnation and The Obsessive Devotion, spliced with latest single Victims of Contigency. Simone looks like she’s having a great time, dancing and headbanging around the stage and frequently flashing big smiles. 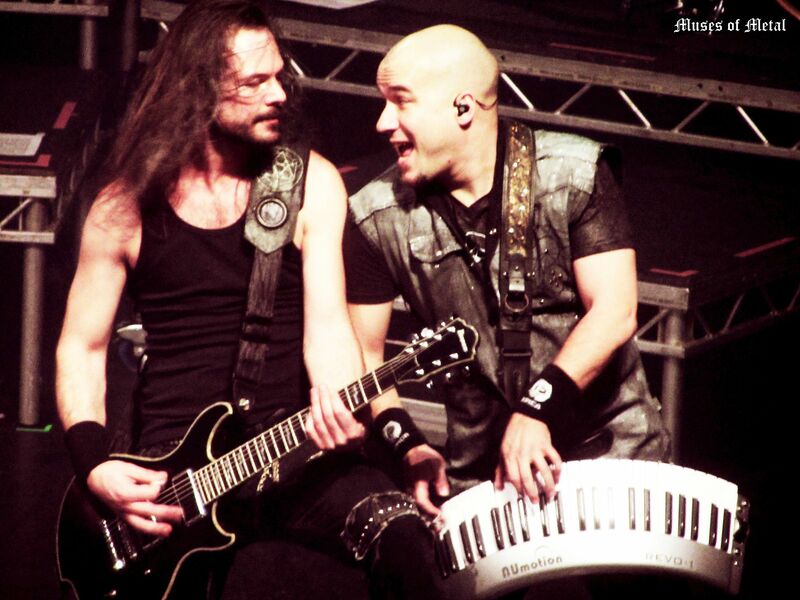 The rest of the band bring equal passion, and there’s fun little moments like where guitarists Rob, Isaac and Mark all line up only to be joined by Coen with his portable keyboard. The Fifth Guardian provides a short interlude into Chemical Insomnia, and then it’s back for more classics with Sancta Terra and The Last Crusade. Finally the band brings out one of their longer epics in the form of the title track of Design Your Universe – and although it’s cut a little short to save time, it’s still an incredible song and a great one to end on before the encore. After a short break, the band return. 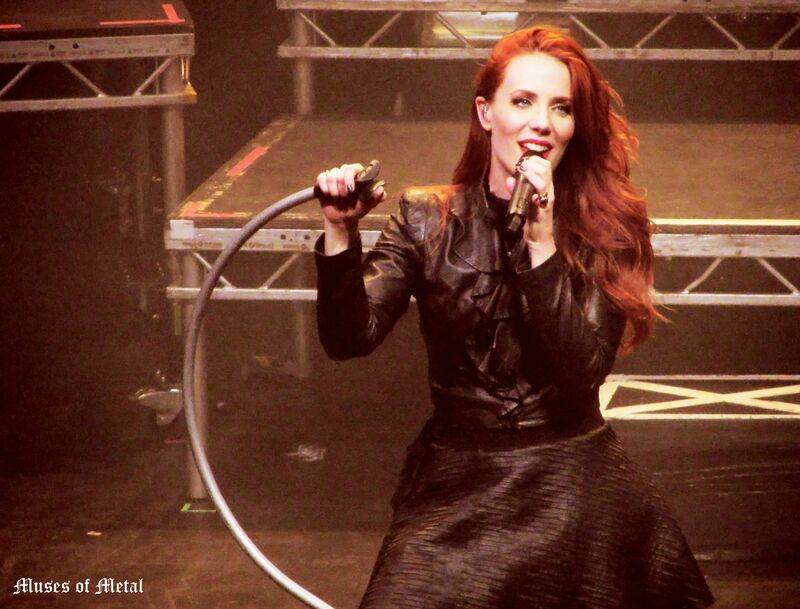 Of course the concert wouldn’t be complete without Cry for the Moon, many people’s first ever Epica song. It ends with an impressive drum solo from Ariën Van Weesenbeek, and then fans get the chance to sing along to another single from new album The Quantum Enigma – Unchain Utopia.